The staggering growth of Type 2 diabetes among Oklahomans is as much an issue of poor government planning and policy as it is the consequence of lifestyle choices. That will be disputed, of course, by the all powerful right-wing here, but what can’t be disputed is the fact that Oklahoma’s rate of diabetes growth among residents was 226 percent from 1995 to 2010, according to a report by the Centers for Disease Control and Prevention (CDC). Oklahoma led the nation in this dubious category. The next state with the highest diabetes growth was Kentucky with 158 percent, which makes Oklahoma’s high rate even more telling. That’s a 68 percent difference. According to the CDC, Type 2 diabetes, which can be prevented through better eating and exercising habits, accounts for 90 to 95 percent of all diabetes occurrences. Obesity is a major contributing factor to the rise of Type 2 diabetes cases. Conservative leaders here make lifestyle change the main issue when it comes to the state’s poor health rankings, often ignoring the impact of governmental decisions on the problems. The Oklahoman, for example, recently editorialized that people’s lifestyle choices are almost exclusively the problem when it comes to the rising diabetes rate. Obviously, the newspaper’s editorials promoting individual responsibility at the exclusion of sound government health policy-an ideology shared by many conservatives here– has had a detrimental effect on the state. Is Oklahoma the unhealthiest state in the nation, according to an overview of all its poor health rankings and other factors, such as poverty and low college graduation rates? One could make that case. If it’s not THE unhealthiest state, then it’s certainly near the bottom, and simply urging people to exercise and eat more vegetables and fruits is not working. Build sidewalks, parks and trails. This should be a no-brainer. As we all know, Oklahoma, especially Oklahoma City, was built and planned for the automobile. This means that walking is not normally incorporated in many people’s lives here. Urban sprawl is another major issue. Oklahoma City Councilman Dr. Ed Shadid has been a major proponent of getting people moving locally, and the sidewalks portion of MAPS 3 in Oklahoma City is vitally important. But the state, cities and even counties need a major concerted effort to build more sidewalks and create more spaces-like parks and trails-to encourage exercise. Ultimately, the state saves money in medical costs if people are healthier, but it takes a long-range view of infrastructure to make this happen. Better funding for health programs, especially for the poor. Gov. Mary Fallin’s recent decision, supported by her Republican colleagues, to not expand Medicaid coverage here for poor people under the Affordable Care Act is symbolic of how the state has failed to embrace a long-term vision for the health of its residents. A healthier population SAVES money in the long-term and is far more productive to the overall economy. Fallin’s decision is just one of many by state leaders through the years that have led to underfunded health and social services programs and to the dilemma of more than 600,000 Oklahomans without health insurance. The state needs to reverse its course in terms of health policy. More medical access. Simply put, thousands of people here need easier access to physicians, and they need health insurance or less expensive care. Physicians, besides just treating diabetes, can help patients with weight management in a variety of ways. 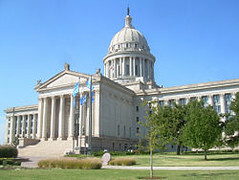 Oklahoma has long been known as a state with poor medical access, especially in rural areas. This contributes to all of the state’s poor health rankings, and its resolution should be a priority for government leaders. This issue might be multi-layered in some ways-the cost of a declining rural population, for example, faced by many states-but the basic idea of getting more people to see doctors for care should be supported by government policy, not discouraged because of costs. Physical and health education at schools. School districts, backed by the state, need to increase physical education opportunities and programs for students during the school day and afterwards. The state should also increase its offerings of health classes, including those that focus on nutrition. Physical and health education in Oklahoma needs to be incorporated in across-the-curriculum school programs that promote wise lifestyle choices in a realistic, honest way. This needs to start as early as possible. It’s easy to just encourage people to exercise and eat better as a solution to the state’s terrible health rankings and the suffering it creates. Why not just make a poster? It ignores the stark realities of not having basic access to sidewalks or doctors or health insurance. Ultimately, it’s a major copout. Government policy and action can make a difference.